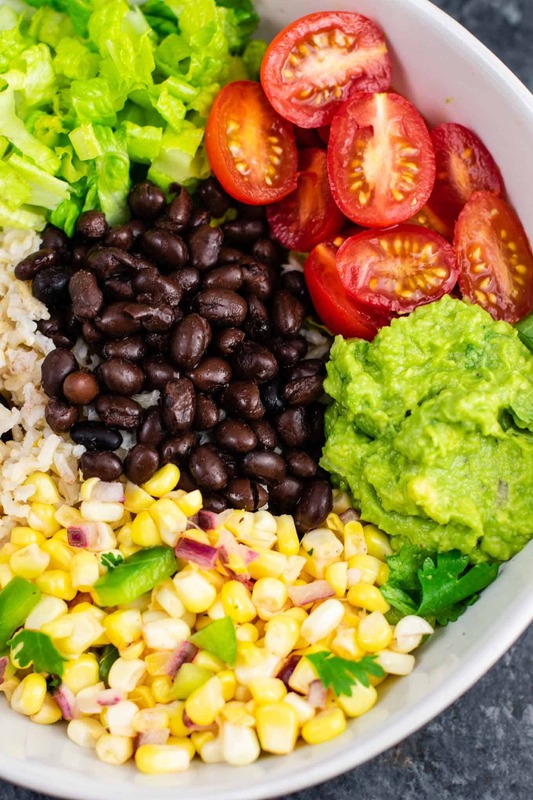 Chipotle has long been one of my favorite healthy takeout restaurants, but anyone who has been knows just how quickly the price can increase on a burrito bowl with all the fixings, plus guac and chips! Even with the price tag, Chipotle has my heart with it’s fresh corn salsa and tons of vegan and vegetarian options. 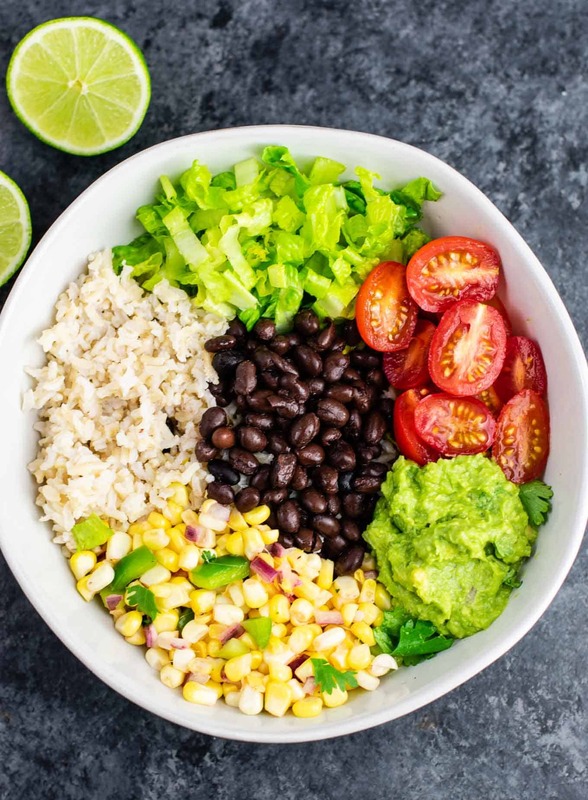 Today I’m recreating that Chipotle magic for you in the form of this vegan burrito bowl recipe! 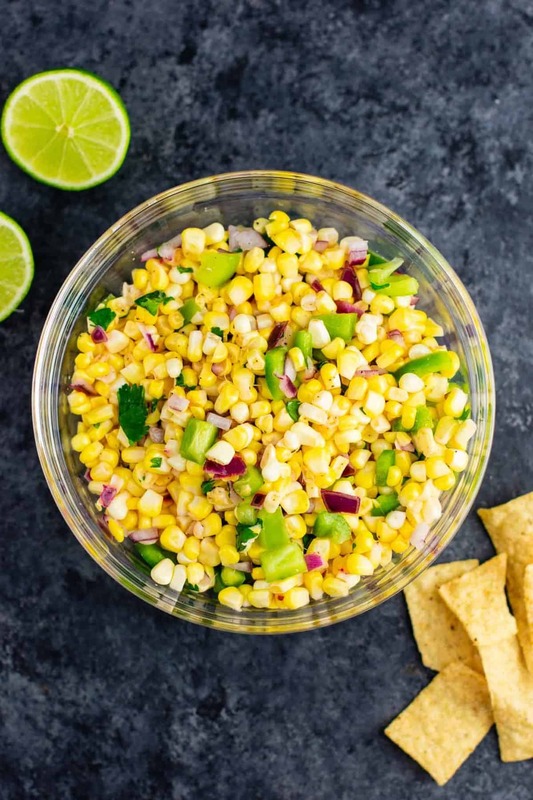 Yesterday I posted a recipe for fresh corn salsa that we will be using in this recipe, along with homemade guacamole. 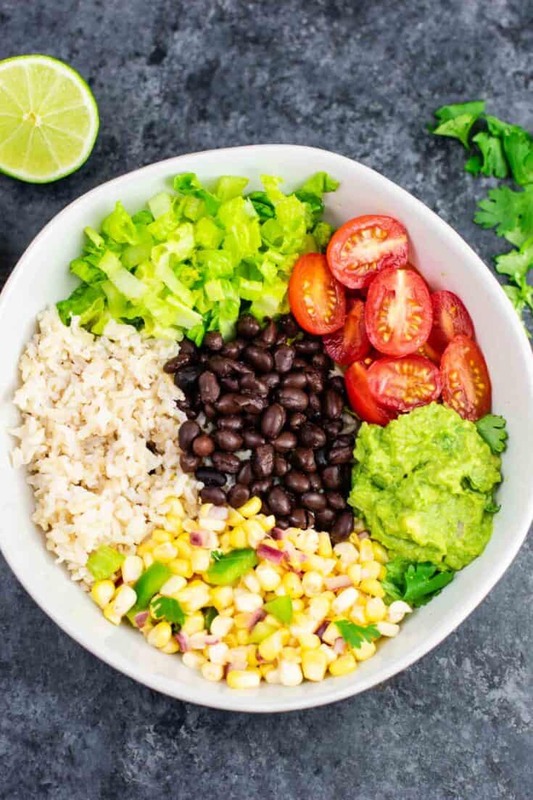 It really is so simple to make your own drool worthy burrito bowl at home, all you need is a little time to chop up and assemble everything! 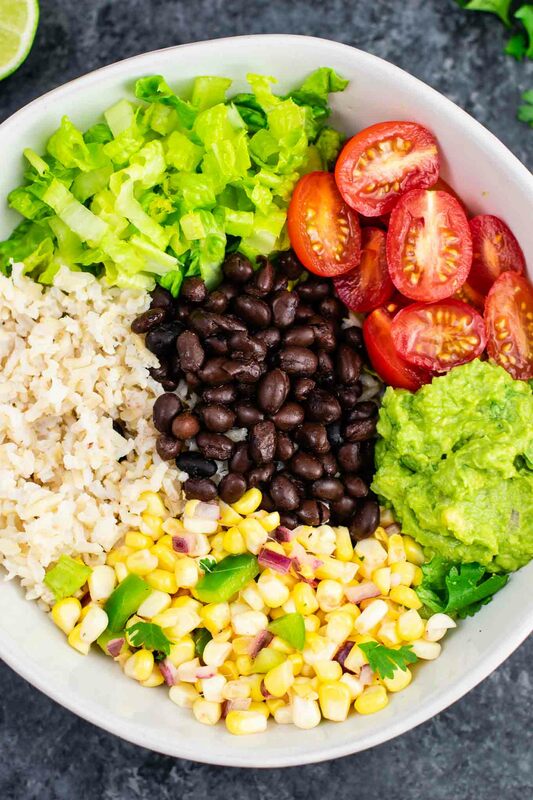 There is no actual baking required (save for the rice), so although these vegan burrito bowls look fancy, they are so easy to make! I put my brown rice in a rice cooker and got to work assembling the other ingredients while it cooked. First, I made a batch of my perfect guacamole recipe. This time I left the tomatoes out and served them on the side for added visual effect, but you can mix them in as usual – either way! Next, I made a batch of fresh corn salsa. And omg let me say that this is my new addiction! Holy freaking moly it is delicious. I had a hard time stopping myself from eating too much just dipped in tortilla chips! I chose to make my corn salsa non spicy (since I have a toddler), but if you dig that spicy kick you could throw in a little chopped jalapeno for some heat! One thing to note is that the corn salsa is best served fresh. You can store it in the fridge, but once the water and juices start to release it will not be as good as served fresh. That’s why it’s called fresh corn salsa I guess! Somehow I don’t think you’ll have a problem finishing off this recipe the same day though! If you are cooking for less than 4 people, you can just adjust how much you make accordingly. For the black beans, all I did was rinse and drain them. The flavors from all of the ingredients take over the dish, so there’s no need to season your beans. That means less work too! Chop up some fresh crunchy romaine lettuce and halve some cherry tomatoes and you are ready to assemble your vegan burrito bowl! We served ours with tortilla chips and devoured them. It was so delicious I had a second bowl for lunch at 4 pm because I just couldn’t stop thinking about it! If you love chipotle, you will go crazy for this recipe. So insanely fresh and bursting with so much flavor. I can’t get enough! 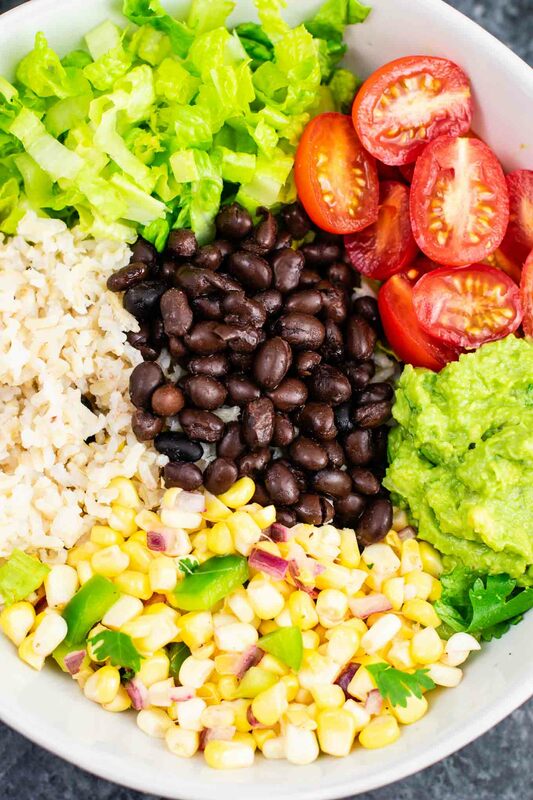 Homemade burrito bowls are definitely going to be a regular item on our menu from now on. hungry for more? Here are some more delicious vegan mexican recipes. 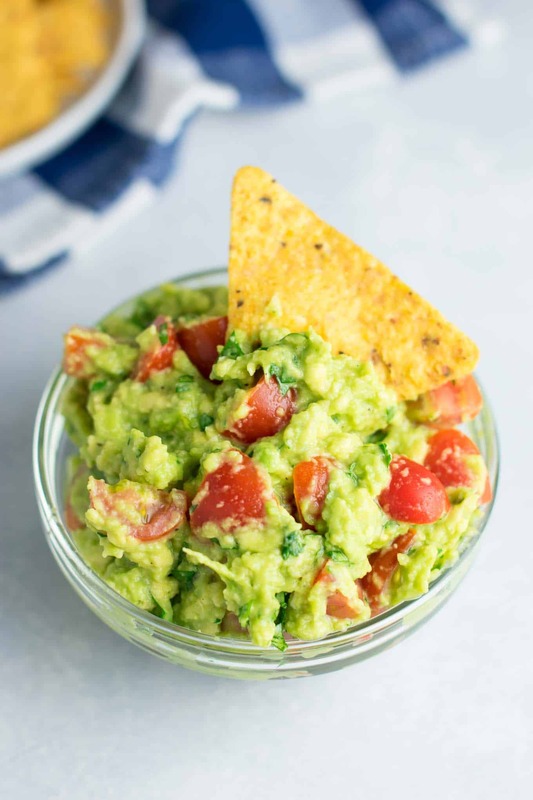 While rice is cooking, make a batch of guacamole.